Who doesn't love a game of BINGO? Guests will enjoy playing this fun interactive baby shower game. 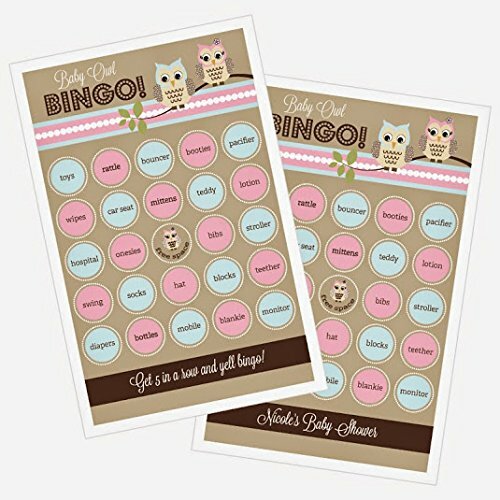 These Woodland Owl Baby Shower Bingo Cards are pre-printed with common baby shower related words, each card is unique - no 2 are alike! A word list is also provided, just tear out the cards, drop them in a bowl and draw at random. First person to get 5 in a row yells BINGO! Middle square is a free space on all cards. Guests can use a pen to cross off called bingo words OR you can provide them with creative bingo markers like life savers or chocolate kisses (markers not included).